Elementary students from across the district enjoy a fun day of activities at Panorama Ridge Secondary School. 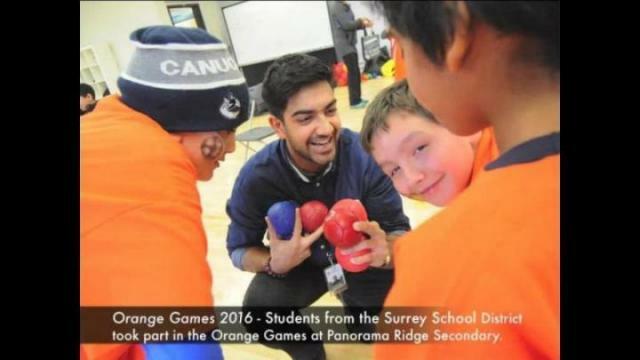 Hundreds of Surrey Elementary students took part in the Orange Games on Friday at Panorama Ridge Secondary School in Newton. The annual event for students with mental and physical disabilities has been a tradition at the school for more than a decade and features numerous sports and activitie, including boccia, floor hockey, hoola-hoop competitions, face painting and basketball – along with numerous non-competitive carnival-style games and challenges. Each student was given an orange t-shirt at the fun-filled event, which encourages participation and inclusion between the Surrey School District’s elementary and secondary school students.